Rich solid White Belgian chocolate is the perfect base for these unique logo chocolates. Print your full-color design using our exclusive printing process edible ink makes these gift ideas one-of-a-kind. 2-3 Days (plus transit time). Rush Service Available. Ship to multiple addresses during checkout, or contact us via the Request Estimate form below for more help. If you need 249 or less, you can order here. If you need 250 or more, click the REQUEST ESTIMATE tab above to contact one of our Gift Experts. Choose Delivery Date & Gift Message at checkout. Delivered anywhere in Continental USA. Fill out the form below and one of our Gift Experts will get right back to you with an estimate. Need 249 or less? Click the ORDER NOW tab above to place your order today. Fill out the form below and one of our Gift Experts will get right back to you to answer your questions. Rich solid White Belgian chocolate Pops are the perfect favor for Special Occasion Parties and Events. 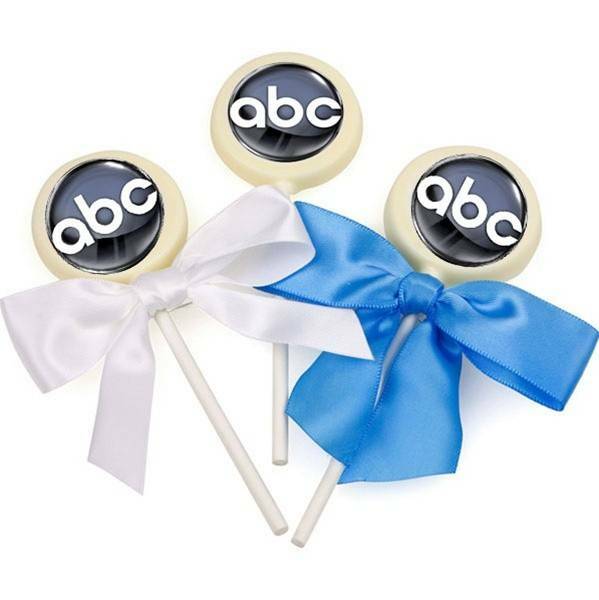 They are also an ideal marketing confection for Corporate giveaways or business events. Each delicious Pop is handmade from luscious Belgian White Chocolate. Your full-color image is applied using our exclusive process. Each Pop is packaged in its own crystal clear cellophane bag and finished with a metallic twist tie or add a lush Satin Bow for extra impact! Be first in line for special deals and promotions.